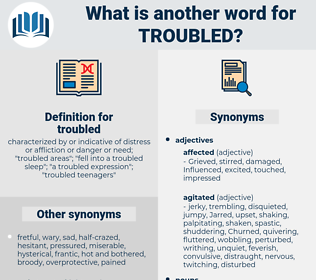 What is another word for troubled? characterized by or indicative of distress or affliction or danger or need; " troubled areas"; " fell into a troubled sleep"; " a troubled expression"; " troubled teenagers"
distressed, troubling, unsettled, disordered, worried, upset, agitated, deadlocked, blurry, disquieting, complicated, stormy, anxious, struggling, contentious, Stalled, disputed, war-torn, chaotic, tortured, disorganized, worrisome, ailing, hectic, challenging, stricken, Conflictive, conflicting, apprehensive, bereaved, worrying, shocked, long-suffering, rough, tough, mixed, destabilizing, conflict, bumpy, alarmed, distressing, excited, unsettling, undisturbed, painful, confusing, uncomfortable, disruptive, tricky, convoluted, blurred, vulnerable, affected, confrontational, non-performing, fearful, murky, shaky, onerous, rugged, burdensome, awkward, soured, sluggish, sensitive, flagging. bothered, Struggled, inconvenienced, Challenged, puzzled, muddled, burdened, obstructed, beset, outraged, baffled, rattled, trapped, Suffered, overcome, disquieted, disturbed, embroiled, embarrassed, stressed, Confronted, preoccupied, encumbered, interrupted, Worked, destroyed, plagued, threatened, Hindered, scared, bruised, crippled, intimidated, buffeted, constrained, Discriminated, Hampered, pestered, Subjected, disrupted, undermined, Influenced, distracted, Batted, offended, impeded, mired, devoted, distorted, Derailed, shattered, Endured, handicapped, ridden, dismayed, harassed, concussed, faced, aggrieved, HIT, stretched, touched, marred, vexed, moved, ensured, Preyed, Looked, Compromised, expressed, engulfed, struck, locked, eaten, stuck, shaken, Exercised, consumed, dazed, Earmarked, distressed, haunted, wracked, Racked, appalled, stranded, deprived, vitiated, gripped, amazed, Rocked, ravaged, Cared, backed, unhinged, stunned, unsettled, disordered, confused, perturbed, concerned, worried, upset, agitated, deadlocked, complicated, Stalled, stricken, shocked, mixed, alarmed, affected. turbulent, difficult, Beleaguered, troublesome, problematic, restless, confused, tumultuous, volatile, flustered, perturbed, embattled, concerned, distraught, disturbing, strained, conflictual, choppy, uneasy, precarious, problematical, stumbling, tense, unstable, cumbersome, difficulty, eventful, turbid, jittery, rocky. unworried, indifferent, assured, tranqil, content, unconcerned, happy. balanced, peaceful, sane, sound, at ease, quiet, composed, settled. calm, self-assured, collected, cool, self-controlled, trouble-free, controlled, easy, dreamless, relaxed, sure, confident, happy-go-lucky, self-confident, nerveless. assist, be happy, aid, help, be content. Will you be troubled with me? Humphrey sat silent, looking on the ground, while the Squire, with a troubled look on his face, waited for him to speak.